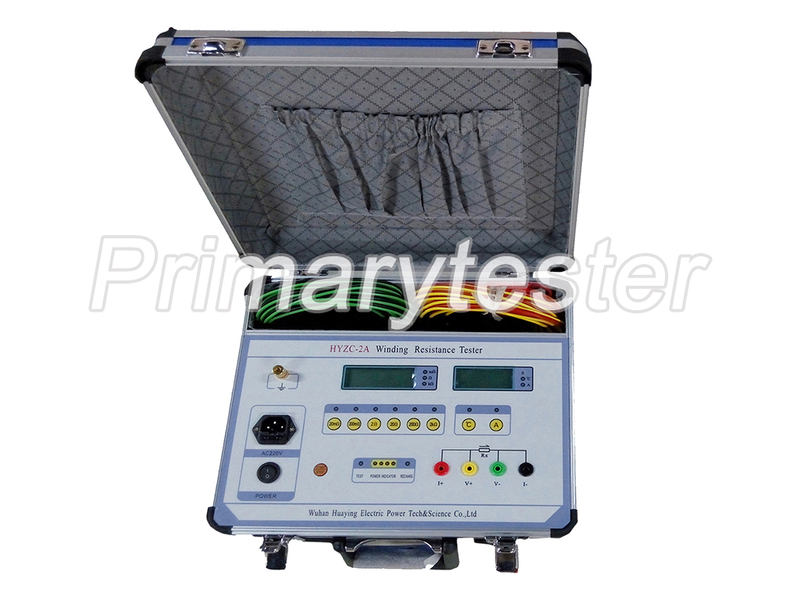 The HYZC-2A type winding resistance tester (micro-ohmmeter) is a high precision new generation product that can replace DC Wheatstone Bridge and double-arm Bridge. The device adopts the advanced starting power constant current source technology, uses four digit and half LCD display value and three digit and half LCD displays the ambient temperature or test current value, it overcomes the shortcoming that the LED display ambient value reading of other similar product is not convenient to read under the sun, at the same time it has the automatic arc extinguishing function. 1. The device has the advantages of quick speed measuring, high precision, visual display, strong anti-interference capability, small cubage, economical power consuming, stable and reliable test data, not affected by personal factor. 2. It is an ideal device to measure various sensible loaded resistance and low voltage starting contact resistance, line and cable resistance and welded seam interface. 3. The product is a quickest measuring device to measure the DC resistance of current domestic large inductance equipment such as power transformer. Tts speed is over one hundred times quicker than the bridge. 4. The chargeable cell set (12V) is equipped inside the device. 5. The device is AC, DC two purpose, and it is convenient to use when there is no AC power source in the site and field measuring. DC11V~14V (the lead-acid chargeable cell set), capacity1.2Ah.